A very special 200th anniversary show featuring some clips from the past and how the show made it this far (we really can't believe it). After a walk down memory lane, Joe and Robert focus on the orange week that was Content Marketing World and all the joyful festivities on audience building. In other news, the boys review the latest CMO trend findings while Facebook begins a billion-dollar push into original content. Rants and raves include Facebook metrics, Equifax and M&A is getting real. This week's TOM example: The Rock Island Line. Thank you to all our listeners for making #200 so special! The final episode of This Old Marketing includes answering listener questions on the future of content marketing, Joe and Robert asking each other their own questions, and a few other surprises along the way. It's been an amazing ride. Thank you for making it possible. PNR 210: Why Won't CMO's Consider Buying Media Companies? In this final regular episode of This Old Marketing, Robert and Joe discuss which company will buy Fox, and whether Apple will ever buy Disney. Something is increasingly disturbing about web content, while media companies rush into the agency services business. Rants and raves include net neutrality and audio content. The final TOM example: This Old Marketing. Go to http://storyblocks.com/cmi to get all the stock images, video, and audio you can imagine for $149. In this episode of #ThisOldMarketing, Robert and Joe unpack the latest content marketing spending research and whether or not we can actually believe it. Marketing predictions are back again, while the boys discuss the success or failure of Casper's content brand Van Winkle's. Rants and raves include building an audience, Snapchat, and the art of questioning. This week's TOM example: Maxwell House Haggadah. 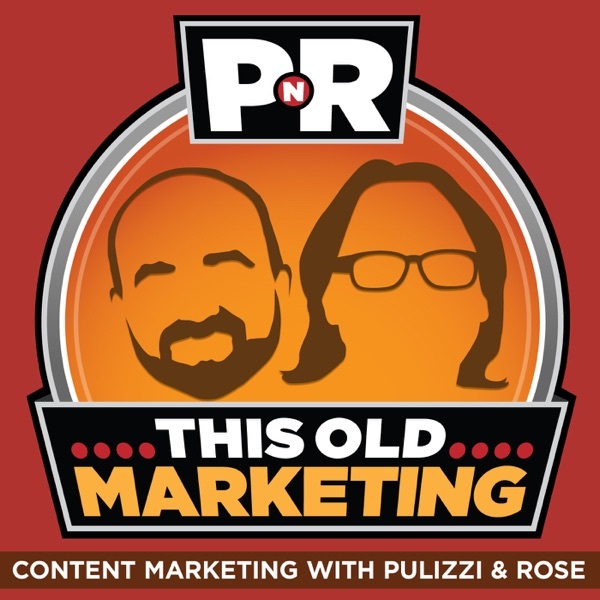 PNR 208: Is there a Crisis in Content Marketing? In this episode, Joe and Robert discuss the recent reader revenue moves from both CNN and the Guardian, while Facebook may or may not have anything to fear from ad blockers. In other news, the boys discuss whether content marketing is in crisis...or perhaps...we see its biggest opportunity to come. Rants and raves include more audience building and whether the flight to video could actually be a bad thing for some publishers. This week's TOM example: Electric Boat Company. John Holland"...(father of US submarines) founded the Electric Boat Company in 1899 to build submarines. After Holland's death in 1914, EB reorganized and the name was changed to Submarine Boat Corporation around 1915." In this episode of This Old Marketing, Joe makes a big announcement about his future and the future of the podcast, while the future of advertising isn't quite settled. LinkedIn has a huge opportunity with original content but might not take it and the latest blogging research says that longer posts are better. Rants and raves include the power of audience and another Mumbrella post. This week's TOM example: Lloyd's List. Lloyd's coffee shop. London. 1686. In this episode of This Old Marketing, Joe and Robert discuss the new initiative from three marketing associations that put the blame for bad online advertising directly on the shoulders of publishers (excuse me). In other news, media companies still rank first for loyalty, but these aren't the media companies you were looking for. Rants and raves include Nielsen's bid at measuring Netflix and one-hit wonders and what we can learn from them. This week's TOM: Polyface Farms. Any listener that tweets using #thisoldmarketing now through October 28 will be entered into a drawing to win an annual Ahrefs account plus a signed copy of Joe and Robert’s new book, Killing Marketing. In this episode, Joe and Robert discuss the Brandwatch/Buzzsumo acquisition, while Snapchat adds location-based services. Mercedes launches their own "killing marketing" model for their integrated content brands, and there is one article format that rises above them all. Rants and raves include a new marketing model and transparency. This week's TOM: Alcoa. PNR 204: Is Google's Subscription Gift to Publishers a Trojan Horse? In this episode of This Old Marketing, Joe and Robert discuss Google's olive branch to publishers and why it may not mean what we think it means. Amazon gets into the advertising business, while Blue Apron doubles down on podcasting. Rants and raves include Lloyds Bank doubling down on content marketing and Amazon reminds us that we need to reflect on our business models. This week's TOM example: The Points Guy. In this episode of This Old Marketing the boys discuss the week that was Advertising Week. Google and Amazon begin the war to end all wars, while Twitter is wasting everyone's time going to 280 characters. Rants and raves include Time's new membership model and Nielsen ratings. This week's TOM example: Chagrin Falls Film Festival. In this episode of This Old Marketing, Google buys HTC, talent is drying up in advertising, and the Mayo Clinic figures out how to dominate Alexa's voice search results. Rants and raves include predictive analytics and this week's This Old Marketing example is full of Fluff. Any listener that tweets using #thisoldmarketing between the dates of September 30 through October 28 will be entered into a drawing to win an annual Ahrefs account plus a signed copy of Joe and Robert’s new book, Killing Marketing. One randomly selected participant will be drawn each week; four winners in total. In this episode of #ThisOldMarketing, Joe and Robert discuss Apple's new browser settings that have the advertising associations crying wolf. Google kills their "first click free" setting for all pay walls and Rolling Stone gets put up for sale. Rants and raves include the fall of bundled television and the Ohio Lottery. This week's TOM example: Fearless Girl. In this pre-Content Marketing World episode, Joe and Robert discuss the possibility of Google buying Marketo, and why the big money will continue to go to Marketing Tech (and away from Advertising Tech). Trade Desk tries to fight the ad fraud battle, and the boys believe this is one big waste of time. Rants and raves include Rob Scallon and Taylor Swift. This week's TOM example: Warsaw, Indiana. In this episode of #ThisOldMarketing, Joe and Robert discuss the latest quarterly results from WPP and how the slowing of advertising could mark something more than a cyclical blip. Add to that, Google begins to reimburse clients and agencies for ad fraud...but is it enough? The Washington Post adds artificial intelligence to native and Goop gets leveled by Truth in Advertising. Rants and raves include Australia (yes, the entire continent) and U-Haul Trucks. This week's TOM example - CTO Advisor. PNR 197: Could Apple Go Wrong with Its Billion Dollar Content Investment? This week, Joe and Robert cover Apple's $1 billion dollar investment in original content...plus the rise and fall of fidget spinners and newsjackers on the eclipse. Is Facebook failing (or is the research behind it?) and do publishers realize how much their business model is actually changing? Rants and raves include Zillow's book on real estate and Harvard Business Review. This week's TOM example: AAHA Magazine. In this episode, Facebook launches YouTube competitor Watch, while Netflix begins a buying spree for content brands. Disney pulls its content from Netflix and Google may possibly still buy Snap. In other news, Quartz has figured out how to deliver real results for branded content and email subscription has never been more important. Rants and raves include Deadpool and Time Inc. This week's TOM example: J. Walter Thompson. In the news this week: Apple hits record earnings, Google launches new SnapChat-like ad format, and AI bots begin to create their own language. Detailed analysis includes the marketing opportunity behind long-form content, while Hasbro's deal with Lions Gate goes south. Rants and raves include Stranger Things and the Facebook/Google duopoly. This week's This Old Marketing example: TheStreet.com and Jim Cramer. In this new-look episode, Joe and Robert cover Lauren Jobs and her purchase of The Atlantic, Facebook's earnings release and what P&G did with $140 million dollars in marketing. The boys then go in-depth on how Hearst is experimenting with ecommerce and why Buzzfeed is launching a skillet for sale. Rants and raves include media buying and a content marketing swindle. This week's TOM: General Electric. P&G Slashes Digital Ads by 140 Million over Brand Safety. Sales Rise Anyway. Why Is Buzzfeed Selling A Hot Plate? The boys take aim at Amazon's new social platform Spark (thumbs down), Google's news feed (thumbs up) and Facebook's addition of branded sub-groups (jury's still out). Rants and raves include building something instead of measuring, and the craze to focus on technology over strategy. This week's This Old Marketing example: Emily McDowell Cards. Joe and Robert cover why a number of publishers are cutting their own advertising and how Fender is taking a page from "Killing Marketing" and developing their own guitar lessons. Joe cuts in early for a rant about Gary V's latest post and why it's bad advice for marketers. Robert then rants about programmatic and raves about Deloitte. This week's TOM example: UBS.